DEADLINE FAST APPROACHING: Help Save an Endangered Schoolhouse in Washington County! Can you provide a good home to a charming one-room brick schoolhouse? The Locust Grove School in Rohrersville cannot stay in its current location. 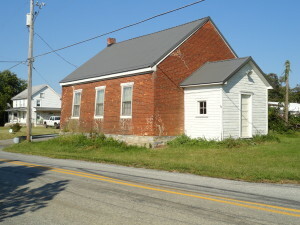 Preservation Maryland and the property owner need your help to find a new steward for this schoolhouse. A demolition permit has been issued for June 1, 2014. We need a plan to preserve the building before the end of the month or it will be lost. Exterior. Locust Grove School, Rohrersville, Washington County. Many one-room schoolhouses became obsolete in the first half of the 20th century and over the past 100 years many of these buildings have been abandoned and then demolished. The Locust Grove School still stands today because it has been cared for over the past 35 years by a family who believed it was their responsibility to help preserve this piece of Maryland’s history. The family can no longer care for the building and wants to give it away to an organization or individual who can find a use for this one story, brick-over-stone foundation structure. The new owner will need to move the building to a new location and make repairs to an exterior wall that started to collapse but has been stabilized. The roof on the schoolhouse is in good condition and was replaced within the last ten years. The current owners researched the cost of moving and repairing the building and are happy to share that information with interested parties. Are you looking for a charming little building to adaptively reuse? Do you know of a historic village complex that needs a one-room schoolhouse to teach children about life in the 19th century? Does your community need a gathering place? If you could use the Locust Grove School in any of these ways or have a different idea for repurposing the building, please contact Margaret De Arcangelis with Preservation Maryland today. We need to work together now to find a new location for this historic little schoolhouse or else it will be demolished.